A RUSSIAN man has been crowned world champion in the novelty sport of chess boxing, a game that requires equal skill at moving pawns and throwing punches. Mathematics student Nikolai Sazhin, 19, competing under the name “The President” knocked out a 37-year-old German policeman Frank Stoldt, who served as a peacekeeper in Kosovo until recently. The loser said he was simply too punch-drunk to fend off checkmate. “I took a lot of body-blows in the fourth round and that affected my concentration. That’s why I made a big mistake in the fifth round: I did not see him coming for my king,” he said. Berlin is home to the world’s biggest chess boxing club with some 40 members and it is in an old freight station here that the two men settled the matter early yesterday. The match began over a chess board set up on a low table in the middle of a boxing ring. Stripped to the waist, wearing towels around their shoulders and headphones playing the lulling sound of a moving train to drown out the baying crowd, the men played for four minutes. Then off came their reading glasses and on went the gloves and the mouthguards. For three minutes they beat each other and then, when the bell went, the chess board was back in the ring and they picked up the gentlemanly game where they had left off. “This is the hard part, you are out of breath but you have to keep your wits about you,” said David Steppeler, a 33-year-old instructor at the local chess boxing club. A chess boxing match consists of six rounds of chess and five in the ring but it can also end suddenly in knockout or checkmate. Alternatively one of the players can be disqualified for taking too long to make his move in the chess rounds or breaking the boxing rules. The weekend saw two matches apart from the world title bout and some of the competitors might have felt equally at home in a MENSA club meeting. One had a doctorate in biochemistry, another held a degree in political science and two were teachers. The best in the world of chess boxing score somewhere between 1700 and 2000 points on the ELO chess rating system – putting them on a par with those who perform well in the sport at club level. Perhaps fittingly, the sport had its beginnings in a comic strip by the French author Enki Bilal, titled Equator Cold that hit shelves in 1992. The last work in Bilal’s The Nikipol Trilogy features a blood-stained chess boxing battle set in an apocalyptic city in 2034. In 2003, the young Dutch artist Iepe Rubingh decided to bring it all to life, but with less brutality, and organised the first match. “But the way we do it is not as dark as it was in the comic strip. For me the thing is to channel your violence, to control it. 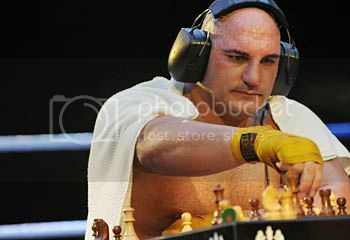 Hence the marriage between boxing and chess,” said Rubingh, who is the president of the international federation of chess boxing. Next story Too Drunk too Whistle! Kersal Massive MEET Kevin Powder!! !